Round Star Foundation is a non-profit organization dedicated to extending the many benefits soccer can provide to every individual. 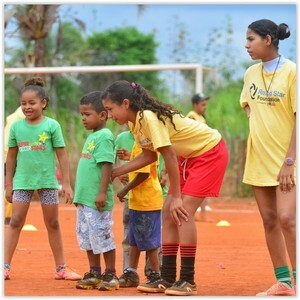 Round Star Foundation works to improve the lives of people of all ages by providing access to high quality soccer activities, training and education. We believe that soccer is an invaluable tool not only for physical development, but for social inclusion, engagement, and a powerful mechanism for strengthening communities. Round Star Foundation works with diverse communities in the United States and around the world. We provide access to quality soccer programming. At Round Star Foundation, we believe that all individuals should have the opportunity to experience soccer regardless of their income. We offer scholarships for participation in soccer classes to children and families that require financial assistance and otherwise could not afford the classes. Thanks to the support of individual and corporate donors, foundation grants and public funding, Round Star Foundation brings soccer instruction and events to low income communities, inner-city schools and community based organizations across the United States. Round Star Foundation also focuses on working with individuals within the special needs community, including children and adults with developmental and intellectual delays such as Autism and Down Syndrome, for whom soccer becomes an essential tool for their overall well-being and success.